When I visited the 2016 George Brown Memorial Sprint, a rather ‘rangy’ sprint machine was being pushed into the back of a van that wasn’t long enough for it. The sprinter had a curious build, consisting of an air-cooled car engine set sideways, with the rider’s seat behind the rear wheel. “Very strange…does that even work?” I wondered, before spending most of the day sketching ‘The Hobbit’, and the long machine being mentally pushed aside. The next day I searched Keith Lee’s excellent ‘Drag Bike Racing in Britain’ to research John Hobbs and his incredible Hobbit machines. There I discovered my ‘long bike’, called Drag Waye, the oddball machine with the rider right out back. I wanted to find out more, but it wasn’t until the next year’s George Brown Sprint that I spent time with Drag Waye and had a chance to talk to the current campaigners of this historical oddity. In order to achieve this 10 to 12% slip, Waye designed a chassis that moved as much weight towards the back wheel as possible. The majority of weight on a motorcycle is comprised of the rider, engine and gearbox, so Waye decided the simplest solution was to move the rider fully to the rear a machine, behind the rear wheel, as moving the engine and gearbox behind the wheel was more complicated. 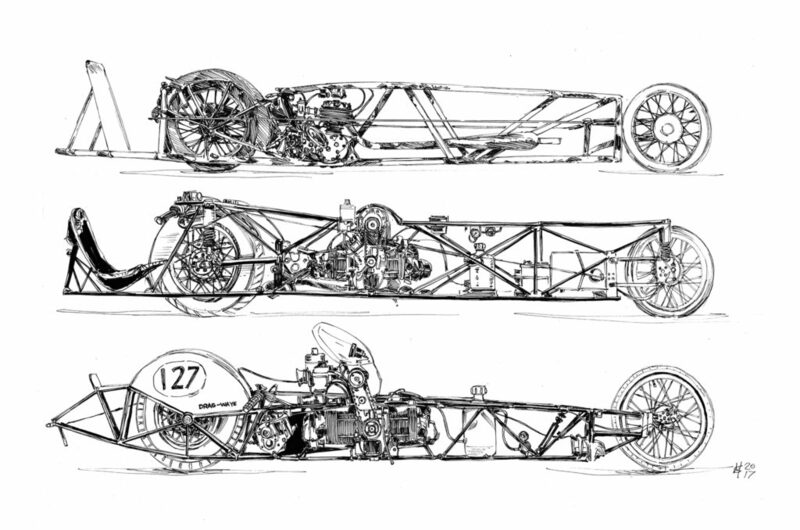 This thinking mirrored the American ‘slingshot’ four-wheeled dragsters of the period, which placed the driver behind the rear axle, and the engine just ahead. To test his theory in 1961, Waye modified an old 16H Norton with a sidevalve 500cc motor – hardly an inspiring start for a dragster – and removed the steering head. 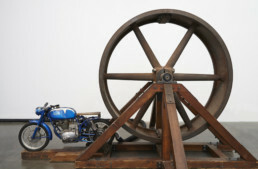 He extended the frame using scrap water pipe to create a ‘rail’ frame with a long wheelbase. The seat was mounted behind the rear wheel and hub-centre steering was incorporated to keep the centre of gravity as low as possible. Initial tests on a disused airfield, with Howard German at the helm, revealed that riding the prototype had a psychological component, as a rider needs to lift his/her feet off the ground so the machine can take off. Once this was overcome, Waye was convinced of his idea, and a new machine was built. The VW flat-four was a controversial engine choice; designed for long life at lower power, the air-cooled car engine was not an obvious choice for sprinting. To produce real power, the VW motor would need to be supercharged, and a four-cylinder engine would deliver smooth power to the rear wheel. The cylinders were sleeved down to give a total engine capacity of 980cc, using widely available (at 10p each) 350cc Royal Enfield WD side-valve pistons! 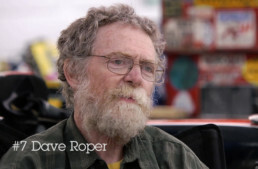 Waye, an electronics boffin, equipped his dragster with recording equipment, so data could be analyzed from each test run; an unheard-of practice at the time. One instrument recorded the distance covered every tenth of a second, while a second instrument recorded the acceleration in G-forces, utilizing a weighted pencil pushing against a spring that plotted a graph on a scrolling piece of paper. In this guise, the machine he named ‘Drag Waye’ recorded 12.1s runs on the quarter mile. 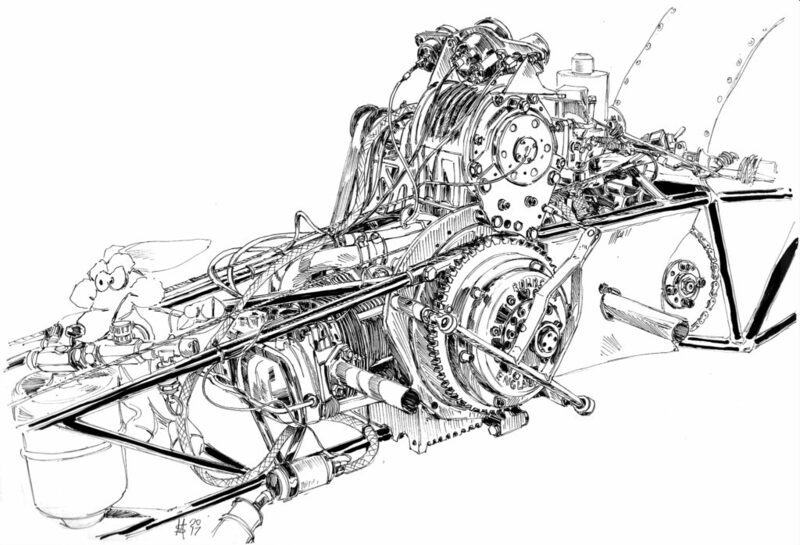 The test equipment would not be mounted on subsequent timed runs, as the machine needed to lose weight, and the engine needed more power to be competitive. At Dragfest in 1964, the combination of Drag Waye and pilot Howard German weighed in at 550lb. The bike’s engine capacity had been increased to 1453cc and the boost pressure to 20psi. In this configuration, the connecting rods crumpled, blowing the crankcase apart. The engine was rebuilt with stronger conrods, and meanwhile ACU regulations capped the dragster engine capacity at 1300cc, so the engine had to be sleeved down. All this resulted in a more robust engine, and coupled with Okrasa twin port heads, hopes were high for Drag Waye. But the machine was still too heavy. An update in The Motor Cycle, September 23, 1965 reported the weight was now down to 450lb. The main change was a lighter frame. Stress engineer Jim Strong (who also worked at Hawker) worked with Waye to produce a simpler structure with lighter gauge tubing. The centre of gravity was lowered and the wheelbase was shortened by a foot… but that was done so the bike fit it in the van! The rear suspension was replaced with a rigid back end, and the front hydraulic suspension was replaced with a single pivoted fork using rubber bands. All these changes added up to a great weight saving. The initial problem with this lighter weight build was its tendency to wheelie on take-off, so a lead lump was added up front to solve the problem, although this counteracted some of the clever weight saving. In 1967 Howard German had to retire from the Drag Waye project due to other business commitments. Luckily Dave Lecoq had test-ridden Drag Waye since 1965 and so the project wasn’t without an experienced rider. After his first few rides, Lecoq convinced Waye that a new riding position was required; Lecoq would hunch over the rear wheel, putting more of his weight directly over the wheel, allowing more control in a power slide. Along with this, Drag Waye was changed to single speed, in the manner of fellow dragster Alf Hagon. All these changes certainly made a difference as Motor Cycle News reported on Wednesday, August 2, 1967 that Dave Lecoq had taken second place at the Duxford Sprint on July 30, with a run of 10.73s. Drag Waye ran at the 1969 NSA World Record Attempts at RAF Elvington where it took the 1300cc world record with a run of 9.815s for the standing quarter mile. Lecoq ran an east/west run of 9.88s and equalled it on the west/east run; this didn’t beat Alf Hagon’s record of 9.954s by the 1 percent required by the FIA, so was discounted. Determined to beat Hagon, Lecoq ran again recording 9.75s east/west and with his west/east run the average was 9.815s, giving him the 1300cc record. These runs were also the fastest ever over the standing start quarter mile, with an average of 91.69mph. Drag Waye continued to set faster times. In 1971, at Elvington, our oddball hit 150mph, with a time of 9.58s. After 1972 Drag Waye took a hiatus, but returned to Elvington in 1977 with a new pilot, Brian Jones. Even though it had some handling issues, it set a new 2000cc standing kilometre record of 22.37s. Drag Waye competed until 1982, when it was retired after running at the George Brown Memorial Sprint that year. After these incredible achievements, the next account of Drag Waye’s history is of its resurrection. 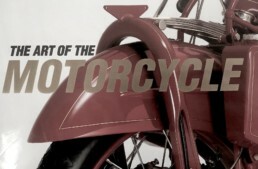 The machine was owned by Clive’s son Scott, who had taken it back from its home in the London Motorcycle Museum, so the machine hadn’t been seen for years. Terry Homan, a fan of the machine since he had seen it run in period, convinced Scott to let him and his father John resurrect Drag Waye, after Scott brought Drag Waye to the final Classic Bike Sprint at North Waeld in 2003. Once in their possession, it wasn’t long before John was rebuilding the engine. The plan was to put the machine back to its late 1960s/early 1970s incarnation, as this was when the machine was at its peak. This was no easy task, as there were no notes, only period photos, and the machine had been changed, especially the frame. Tom Touhy, a trike builder, was the man for the job of sorting the frame and work continued with all the interested parties. Unfortunately, John suffered a stroke that he would never recover from and so work stopped – not only due to the loss of the most capable assistant, but also Terry’s grief curtailed his straight-line enthusiasm. He even sold the sprinter that his father had built for him. Keith Lee asked Terry on a few occasions if he could bring Drag Waye to Dragstalgia. Initially, Terry couldn’t bring himself to finish the project, though during this time Drag Waye was given over to Tom Touhy in the hope that progress would be made. It did, slowly, but only the motor was fitted into the frame within the following year. Keith Lee rang again; this time, Terry had a change of mind and decided having a deadline would force him to get on. Within six months, more work was done on Drag Waye than had been in the eight years since Scott handed it over. In July 2016, six years after Terry’s father death, Drag Waye was started in the paddock at Santa Pod for the first time since 1982. Terry has been running and learning about Drag Waye, first hand, since this return to Santa Pod. When I saw it at the George Brown strip last year, Terry had been attempting to run Drag Waye at North Weald and Dragstalgia, but had various issues, including getting thrown off Drag Waye, breaking a couple of ribs and dislocating his shoulder. The 2017 visit to the George Brown Memorial Sprint was not without issues, as the crash at North Weald in May had damaged the distributor. Luckily, Ian Clark, a VW nut, lived nearby and came to the airfield to save the day. Drag Waye was converted back to points and was good to go. After a cautious run, Terry experienced first hand what Waye and German had on the Norton prototype. Lecoq actually visited the George Brown Memorial Sprint in 2017, and told Terry; “You’re going to need a lot of practice. Now, have you had it wheelie yet?” On the Sunday Terry got brave and gave it a bit more wrist and, yes, it did.